Anyone who knows Chrissy Bambry knows she is passionate about her horses. 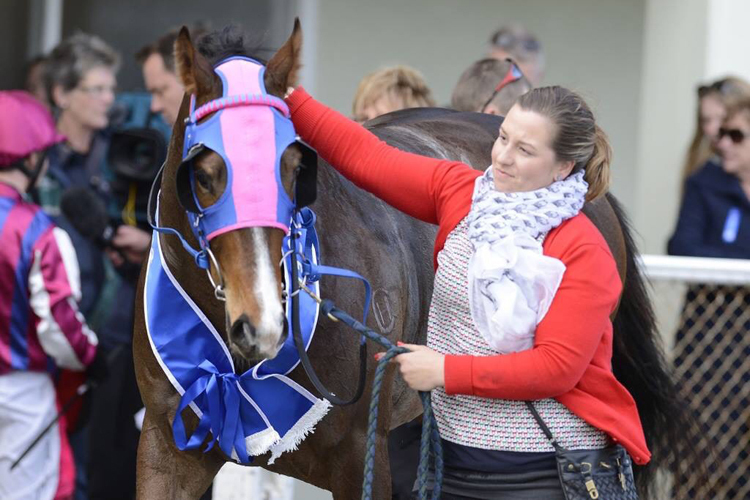 The effervescent 31-year-old horse-woman from Manawatu is the daughter of Foxton trainer Tony Bambry, and she has devoted her life to the animal she loves. This week Bambry, who works alongside her father training a small team of horses and preparing horses for sale, has welcomed back stable-favourite Lord Turbo from Hong Kong, with the now eight-year-old set to retire to Bambry’s property. Like so many in the industry, Bambry grew up with horses and has no intention of doing anything else. “I always loved working for Mum and Dad growing up and used to muck out paddocks for a dollar an hour,” Bambry said. “When I was 14 I did a yearling preparation for Gordon Cunningham at Curraghmore and have worked at every yearling sale for him since. “I have also worked for a season in England and I have a close association with the Liston family at Three Bridges in Victoria, who I work for at the Australian sales. “But my day-job is working with Mum and Dad, we’re a family operation. We breed about 8 mares a year and we try to sell some at the yearling sales and we retain some to race and for the Ready to Run Sale. We generally race the fillies. Bambry, who these days owns a property of her own at Rongotea near Palmerston North, credits Lord Turbo as the horse who inspired her to delve further into thoroughbred breeding. “He is out of a mare called Sitting On A Hill that Mum and Dad raced,” Bambry said. “She ran third in the Eulogy and when she retired I bought fifty per cent of her to go into partnership to breed and Lord Turbo was her first foal. “He won his first three starts for us including the Wanganui Guineas with our good friend Rosie Myers riding him. He ran fourth in both the Hawke’s Bay and Wellington Guineas and was unlucky on both occasions. “When I was working at the Ready to Run Sales I approached (Hong Kong trainer) Ricky Yiu and (bloodstock advisor) Dean Hawkes, who we had sold a horse to at that sale about five years earlier, to see if they would be interested in buying him. Under Yiu’s care Lord Turbo won four races and was placed on a further six occasions over the ensuing four seasons on the ultra-competitive Hong Kong circuit. “He got right up to Class 2, which is pretty good in Hong Kong and before he left he compared favourably with a horse like Salamanca, but the money was too good to keep him here,” Bambry said. “It (the sale) definitely paid a few bills and probably fuelled an obsession with breeding horses. Bambry followed Lord Turbo’s career closely during his time in Hong Kong and kept in regular contact with Yiu and Hawkes. “They’re both super, genuine, nice people and I would always annoy them whenever I saw them at each sale and have a chat to them about Turbo. “At Karaka earlier this year, Ricky said he would probably be retired at the end of the season and I said I would give him a home. Bambry was delighted to welcome the Perfectly Ready gelding home this week and it was like he never left. “He can have a few months out in the paddock, just being a horse,” Bambry said. “He went down to the paddock today like he had never been gone. There were 102 horses exported from New Zealand to Hong Kong last season, but more than 200 horses retired from Hong Kong to New Zealand last season, which has become one of the preferred retirement destinations for horses.